Our K-12 curriculum and teacher programs are designed by teachers, for teachers. Integrating green chemistry and sustainable science principles into the classroom creates a safer more engaging learning environment for students and teachers alike. Is green chemistry only for high school? No. 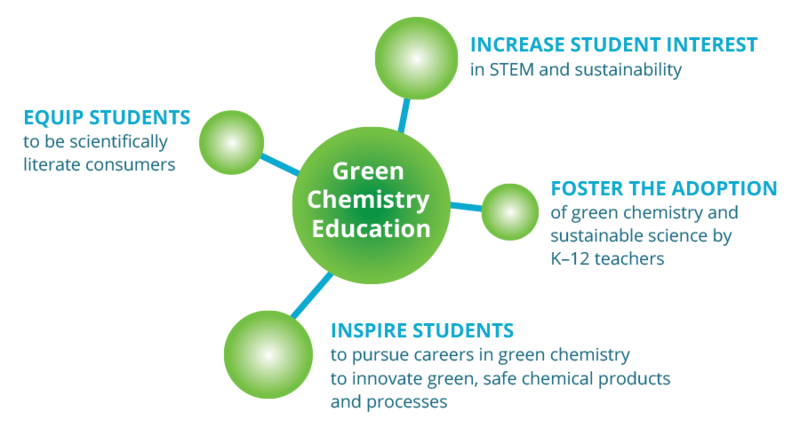 Green chemistry concepts are understood and applicable at K-12 levels. Curriculum resources are available for elementary, middle and high school audiences. What’s the cost to access labs and lessons? Our curriculum materials are available to download in word document format at no cost. Will I have time in my curriculum? Yes. Green chemistry content can be woven into your chemistry lessons and labs throughout the entire year since it is aligned to state and national standards. Our replacement labs are a simple way to bring green chemistry into your existing curriculum plan.